The Tala Hamza Zinc Project (“Project’) is owned by Western Mediterranean Zinc Spa (WMZ), a joint venture vehicle to develop the Project between Terramin and Enterprise Nationale des Produits Miniers Non-Ferreux et des Substances Utiles Spa (ENOF). Terramin holds a 65% shareholding in WMZ, with the remaining 35% held by two Algerian government-owned companies: (32.5%) and Office National de Recherche Géologique et Minière (ORGM) (2.5%). The Project is located on the Mediterranean Sea, 15km from the regional city of Béjaia. The city of Béjaia provides extensive infrastructure including an international airport and deep water port. Location benefits include grid power, abundant water and proximity to European zinc smelters. The Tala Hamza deposit holds a Resource of 68.6Mt (Measured, Indicated and Inferred) at 4.6% zinc and 1.2% lead at a cut off of 2.5% zinc equivalent (inclusive of Probable Reserve). The deposit is situated within the Oued Amizour permit area that covers 125 square kilometres and includes a number of potential additional prospects for lead-zinc and copper. The Project is significant with potential to be one of the top ten zinc producers in the world. The project is well positioned to provide premium zinc and lead concentrate, low in contaminants, to European smelters. Terramin entered into a Technical Cooperation Agreement with (China Non-Ferrous Metal Industry’s Foreign Engineering and Construction Company (NFC) in 2013 under which NFC undertook a technical and financial assessment of mining methods for the Project and presented its findings to the joint venture partners. Following this presentation, Terramin and its partners have formally agreed to progress a preferred mining method through to DFS which based on preliminary modelling, is expected to be economically and technically viable. At the end of 2014, Terramin and NFC updated the feasibility study on the development of the Project on the basis of the mining method agreed with its joint venture partner. ENOF and the Algerian government have completed their review of the revised feasibility study and the parties attended a technical workshop in mid-May 2015 to discuss the outcomes and recommendations of that revised feasibility study. The partners generally agreed that the revised feasibility study, in its current form, is positive, meets the objectives and expectations of the partners and provides a strong basis to move towards a decision to mine. Some additional work as proposed in the revised study, has been agreed to add important data before a decision to mine can be taken by the joint venture partners. This additional work which relates to the hydrology, geotechnical data, mining infrastructure and tailings is generally of a nature that is often performed at the mine design preparation stage. However, in certain jurisdictions, including Algeria, government organisations and regulators require that such work be performed at feasibility stage. Following this workshop, Terramin and NFC developed a work plan which was presented to and discussed with ENOF during the board meeting of WMZ in June 2015. This work programme was generally approved by the board of WMZ. Further, and with agreement of the joint venture partners, WMZ has initiated the renewal process of the exploration licence with the Algerian regulator on the basis of the work programme presented to the WMZ board. The work programme will aim to complete the final aspects of the study in the coming months and proceed with a decision to mine as soon as possible thereafter. From an exploration perspective the Tala Hamza deposit also continues to provide upside potential, particularly to the south where drilling showed the deposit was thicker and higher grade than expected. The deposit is currently open and untested in the south, while there also remains potential to the northeast and east. 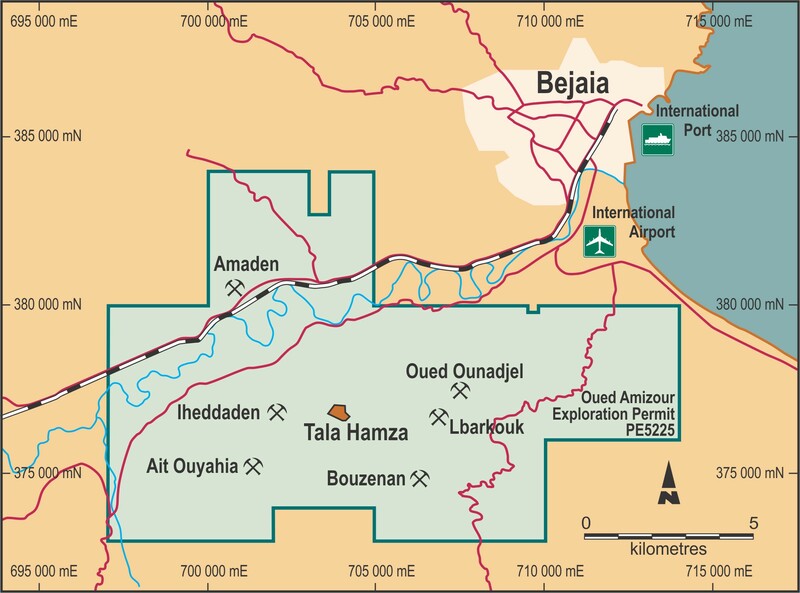 In addition, the area covered by the Oued Amizour permit area hosts a number of other deposits which have not been fully explored which could provide some significant upside to the Tala Hamza project once operating.